Are you looking to improve your health, express your creative side, share your insights or give back through volunteering? At the J we provide all of these opportunities and more for active older adults like yourself. A Tai Chi, Chair Yoga or Circuit class will enhance your balance and circulation. So what are you waiting for? Get moving! As a member, you can try one of our many free group fitness classes designed for seniors including Gentle Yoga, ZUMBA GoldGet Fit Stay Fit, and more. Want to strengthen your knees or enhance your cardio workout in a routine designed specifically for your body? Consider hiring one of our 25 certified personal trainers on staff. Find a trainer that’s right for you. Improve your flexibility and muscle tone by taking a Water Aerobics class. Life can be stressful no matter your age, take advantage of CSA’s Meditation and Tai Chi classes – sign up for Martial Arts classes. Does molding with clay help you channel your inner-Michelangelo? Does holding a paintbrush or pen in your hand make you want to fill an empty canvas? 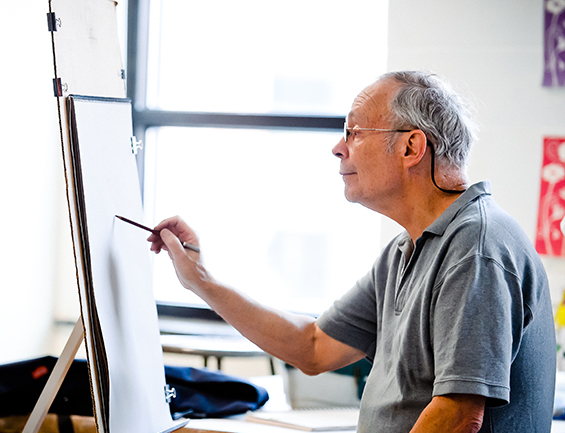 If so, we can help you express yourself through art in our Ceramics, Painting and Drawing classes led by accomplished artists. Looking to join in the conversation and meet new people? Stop by our book club, attend a current events roundtable, or senior social groups. Get involved in our lifelong learning opportunities. There’s nothing like a great night out at the theater to engage your left brain and add spark to your week. We’ve got everything from internationally-acclaimed musicians to hilarious comedy performances to mesmerizing dance at the Gordon Center for Performing Arts. We even have shows you can enjoy with the grandkids! Attention theater lovers: If you are looking for a volunteer opportunity that includes providing warm and engaging customer service with a chance to see top notch performances by regional, national and international talent, the Gordon Center Volunteer Corp could be for you. Volunteer at the Gordon.